The Ladies' Home Journal arose from a popular double-page supplement in the American magazine Tribune and Farmer titled Women at Home. Women at Home was written by Louisa Knapp Curtis, wife of the magazine's publisher Cyrus H. K. Curtis. After a year it became an independent publication with Knapp as editor for the first six years. Its original name was The Ladies Home Journal and Practical Housekeeper, but she dropped the last three words in 1886. It rapidly became the leading American magazine of its type, reaching a circulation of more than one million copies in ten years. Edward W. Bok took over the editorship in late 1889 until 1919. Among features he introduced was the popular Ruth Ashmore advice column written by Isabel Mallon. At the turn of the 20th century, the magazine published the work of muckrakers and social reformers such as Jane Addams. In 1901 it published two articles highlighting the early architectural designs of Frank Lloyd Wright. During World War II, it was a particularly favored venue of the government for messages intended for homemakers. In March 1970, feminists held an 11-hour sit-in at the Ladies' Home Journal's office, which resulted in them getting the opportunity to produce a section of the magazine that August. The Journal, along with its major rivals, Better Homes and Gardens, Family Circle, Good Housekeeping, McCall's, Redbook and Woman's Day were long known as the "seven sisters". For decades, the Journal had the greatest circulation of this group, but it fell behind McCall's in 1961. In 1968, its circulation was 6.8 million compared to McCall's 8.5 million. That year, Curtis Publishing sold the Ladies' Home Journal, along with the magazine The American Home, to Downe Communications for $5.4 million in stock. Between 1969 and 1974 Downe was acquired by Charter Company, which sold the magazine to Family Media Inc., publishers of Health magazine, in 1982 when the company decided to divest its publishing interests. In 1986, the Meredith Corporation acquired the magazine from Family Media for $96 million. By 1998, the Journal's circulation had dropped to 4.5 million. 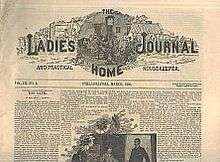 The Ladies' Home Journal's low subscription rates, inclusion of advertising to off-set costs, and reliance on popular content contributed to the publication's success. This operating structure was adopted by men's magazines like McClure's and Munsey's roughly a decade after it had become the standard practice of American women's magazines. Scholars argue that women's magazines, like the Ladies' Home Journal, pioneered these strategies "magazine revolution". The magazine debuted an extensive visual and editorial redesign in its March 2012 issue. Photographer Brigitte Lacombe was hired to shoot cover photos, with Kate Winslet appearing on the first revamped issue. The Journal announced that portions of its editorial content would be crowdsourced from readers, who would be fairly compensated for their work. The arrangement was one of the first of its kind among major consumer magazines. Although the magazine remained very popular, it ran into increasing difficulty attracting advertising. Despite its high subscriber base (3.2 million), it was not a leader in the women's service category, and its relatively old readership was not in a demographic favored by advertisers. These factors prompted the decision to end monthly publication. The magazine was relaunched as a quarterly. At the same time, the headquarters of the magazine moved from New York City to Des Moines, Iowa. Meredith offered its subscribers the chance to transfer their subscriptions to Meredith's sister publications. Knapp continued as the magazine's editor till Edward William Bok succeeded her as LHJ editor in 1889. However, she remained involved with the magazine's management, and she also wrote a column for each issue. In 1892, the LHJ became the first magazine to refuse patent medicine advertisements. In 1896, Bok became Louisa Knapp's son-in-law when he married her daughter, Mary Louise Curtis. The most famous cooking teacher of her time, Sarah Tyson Rorer, served as LHJ's first food editor from 1897 to 1911, when she moved to Good Housekeeping. In 1936, Mary Cookman, wife of New York Post editor Joseph Cookman, began working at the Ladies' Home Journal. In time, she was named its Executive Editor, and she remained with LHJ till 1963. She was known throughout most of her career as Mary Bass. Cookman died in 1991. In 1946, the Journal adopted the slogan, "Never underestimate the power of a woman," which it continues to use today. The magazine's trademark feature is “Can This Marriage Be Saved?” In this popular column, each person of a couple in a troubled marriage explains their view of the problem, a marriage counselor explains the solutions offered in counseling, and the outcome is published. It was written for 30 years, starting in 1953, by Dorothy D. MacKaye under the name of Dorothy Cameron Disney. MacKaye co-founded this column with Paul Popenoe, a founding practitioner of marriage counseling in the U.S. The two jointly wrote a book of the same title in 1960. Both the book and the column drew their material from the extensive case files of the American Institute of Family Relations in Los Angeles, California. MacKaye died in 1992 at the age of 88. Subsequent writers for the feature have included Lois Duncan and Margery D. Rosen. The illustrations of William Ladd Taylor were featured between 1895 and 1926; the magazine also sold reproductions of his works in oil and water-color. 1 2 Marco Santana (April 24, 2014). 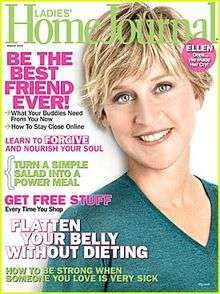 "Ladies' Home Journal to Cease Monthly Publication". Des Moines Register. Retrieved April 24, 2014. ↑ "Meredith Reports Fiscal 2014 Third Quarter And Nine Month Results: Local Media Group Delivers Record Revenues and Operating Profit for a Fiscal Third Quarter" (Press release). Meredith Corporation. April 24, 2014 – via PRNewswire. 1 2 Cohen, Noam (2014-04-25). "Ladies' Home Journal to Become a Quarterly". New York Times. ↑ "Saturday Evening Post & Ladies Home Journal". Curtis Publishing Company. ↑ "Ruth Ashmore" Dead: A Well-Known Writer Succumbs to Pneumonia, Following Grip". The New York Times. December 28, 1898. ↑ "A Home in a Prairie Town". Ladies' Home Journal. February 1901. ↑ "A Small Home with 'Lots of Room in It'". Ladies' Home Journal. July 1901. ↑ Emily Yellin (2004). Our Mothers' War. New York: Free Press. p. 23. ISBN 0-7432-4514-8. ↑ Gibson, Megan (August 12, 2011). "The Ladies' Home Journal Sit-In - A Brief History of Women's Protests". Time. Retrieved January 28, 2015. ↑ Carmody, D. (August 6, 1990). "Identity Crisis for 'Seven Sisters'". The New York Times. ↑ "Revolt at Curtis". Time. October 16, 1964. ↑ Bedingfield, R. E. (August 15, 1968). "Curtis Publishing Sells 2 Magazines; Downe Paying $5.4-Million in Stock". The New York Times. Business and Finance section, p. 54. ↑ "Too Few Believers". Time. August 23, 1968. ↑ "Magna charter". Time. June 16, 1980. ↑ "History of Meredith Corporation". Archived from the original on July 3, 2006. ↑ "Meredith Won't Tinker with Added Magazines". The New York Times (Late City Final ed.). November 25, 1985. p. D2, col 5. ↑ Kuczynski, A. (November 9, 1998). "Some Consumer Magazines Are Getting Real". The New York Times. ↑ Waller-Zuckerman, Mary Ellen (Winter 1989). "'Old Homes, in a City of Perpetual Change': Women's Magazines, 1890-1916". The Business History Review. 63 (4): 715–756. doi:10.2307/3115961. ↑ Botelho, Stefanie (January 10, 2012). "Ladies' Home Journal to Move to Reader-Produced Content Model". Folio. ↑ Ives, Nat (January 9, 2012). "Ladies' Home Journal Lets Readers Write the Magazine". AdvertisingAge. 1 2 3 Emma Bazilian (April 24, 2014). "Ladies' Home Journal to Cease Monthly Publication". AdWeek. Retrieved February 6, 2016. ↑ Kathleen L. Endres; Therese L. Lueck (1995). Women's Periodicals in the United States: Consumer Magazines. Greenwood Publishing Group. p. 172. ISBN 978-0-313-28631-5. Retrieved February 6, 2016. ↑ Bok, Edward William (1921). "30. Cleaning Up the Patent-Medicine and Other Evils.". The Americanization of Edward Bok. ↑ "125 Years of 'Ladies' Home Journal': Food". Ladies' Home Journal. 125 (8). 2008. ↑ "A Look Back in Covers". Ladies Home Journal. 125 (1). 2008. ↑ Weber, Bruce (September 8, 1992). "Dorothy D. MacKaye Dies at 88; Ladies' Home Journal Columnist". The New York Times. ↑ Popenoe, Paul & Disney, Dorothy Cameron (1960). Can This Marriage Be Saved? (1st ed.). New York: Macmillan. OCLC 1319285. Library of Congress number: 60-8124. ↑ Chapman, John, III. "William Ladd Taylor: Biography". W.L. Taylor, American Illustrator. Retrieved April 16, 2010. Bogardus, Ralph F. "Tea Wars: Advertising Photography and Ideology in the Ladies' Home Journal in the 1890s." Prospects 16 (1991) pp: 297-322. Lewis, W. David. "Edward Bok: the editor as entrepreneur." Essays in Economic & Business History 20 (2012). Snyder, Beth Dalia. "Confidence women: Constructing female culture and community in" Just Among Ourselves" and the Ladies' Home Journal." American Transcendental Quarterly 12#4 (1998): 311. Wikimedia Commons has media related to Ladies' Home Journal.